Different people acknowledge Memorial Day in different ways. If you’re a young person, maybe it means nothing more than a chance to go to bed late Sunday night and sleep in Monday. For many working folks, it might merely be one of those paid federal holidays that translates to a much-needed three-day respite from the daily grind. For some folks, Memorial Day is marked with solemnity, while for others it may mean not much at all. It’s also possible that all those examples may have applied to the same person in years gone by, depending on where one was in life. At its heart, though, Memorial Day is the day citizens of this nation are supposed to remember and honor those fellow Americans killed while serving as members of a branch of the U.S. military during one of our many, far too-many wars. Unlike the Go for Broke monument a few blocks away, which is dedicated to the approximately 16,000 Japanese Americans who served in the military during WWII, the Memorial Court has inscribed on its walls only the names of those Japanese Americans who were killed in war, whether it was WWII, the Korean War, the Vietnam War or those felled while serving in Iraq and Afghanistan. An ROTC member while at UCLA, Okamoto applied for and completed Army Ranger training and then was sent to Vietnam as a second lieutenant. He served in the infantry beginning in 1968, the year you could say that the feces really collided with the impeller with regard to how the Vietnam War escalated and proceeded to nearly tear the nation apart over the next few years. Okamoto eventually commanded a rifle company and was awarded the military’s second-highest decoration, the Distinguished Service Cross. 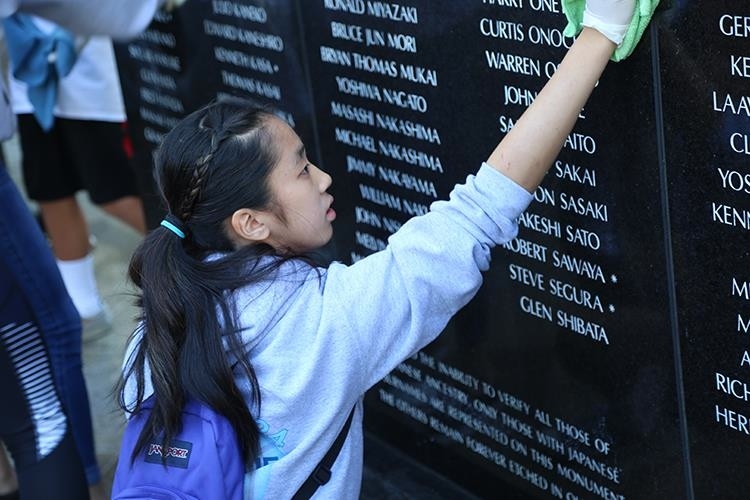 Kiley Murakami polishes a monument bearing the names of Japanese Americans killed while serving in the Korean War at the Japanese American National War Memorial Court on May 13 during the “Spit and Polish” cleanup. “Wolfhound Samurai” is an exceptional, harrowing, gritty and eye-opening account of the Vietnam War told through the eyes of a Japanese American soldier. What “Farewell to Manzanar” is to the experience of one Japanese American child while incarcerated in an American concentration camp during WWII, “Wolfhound Samurai” is to the experience of being a Japanese American G.I. on the frontlines of combat in an unpopular war. 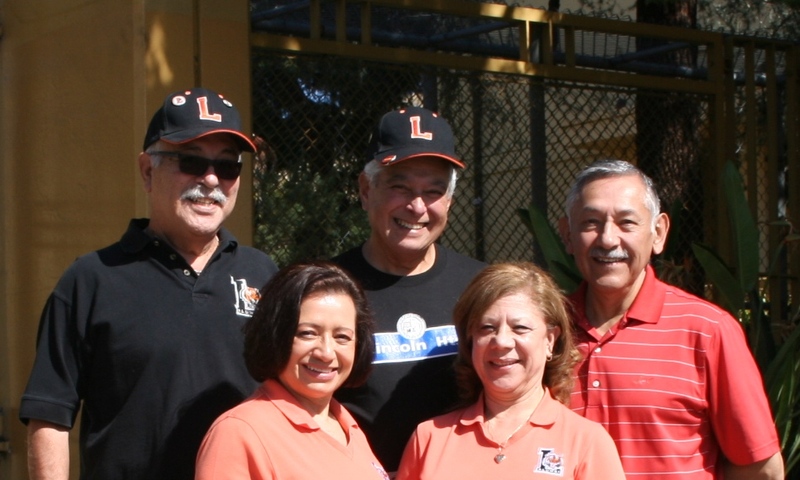 Members of the (Lincoln High School Alumni Association: (front row, from left) Luz Marina Lopez and Maria Sandoval; (back row, from left) Frank Beltran, Marco Robles and Robert Granados. Just as the writing of “FTM” was a venting of pent-up emotions and experiences for its author, Jeanne Wakatsuki Houston, “Wolfhound Samurai” provided a similar exorcism for Okamoto. It can be ordered, along with many other titles, at www.jalivinglegacy.org/main.cfm?stg=nwg. 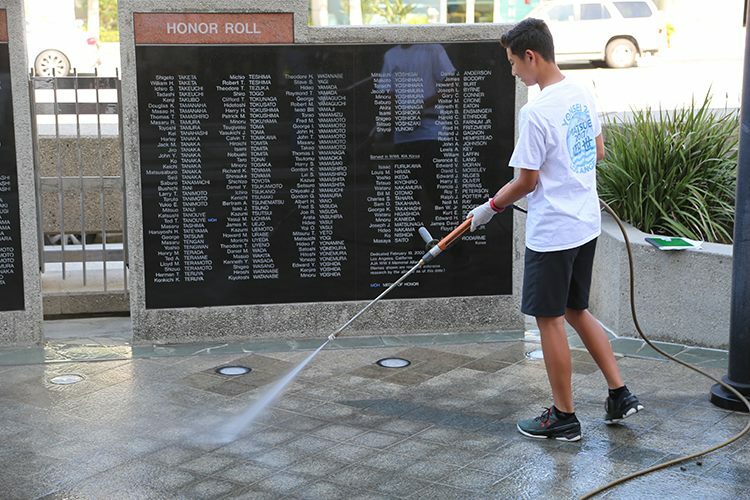 Although his accomplishments are many, Okamoto says that being a prime mover in the creation of the Japanese American National War Memorial Court is “one of the few things I can say I’m proud of in my life, that I can point to and say, ‘I did that.’ ” It would take seven years to make it happen. According to Okamoto, it came about from an accumulation of experiences, including a troubling conversation Okamoto had with a Japanese American Gold Star mother whose son, a Marine, was killed in the Battle of Khe Sanh, and his first visit to the Vietnam Veterans Memorial in Washington, D.C., followed by a conversation that ensued with his then-young son after viewing the black rock wall engraved with the thousands of names of those who were killed or went missing in that war. After returning home to California, Okamoto told his wife, Mitzi, “You know what? We’re going to build a monument with the names of all the Japanese Americans who were killed in the Vietnam War. 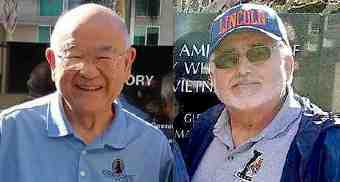 Another “good thing” involving a Japanese American soldier is a drive by the Lincoln High School Alumni Association to build a monument on that school’s campus to an alumnus who was awarded the Medal of Honor during WWII: Sadao Munemori, a member of the Lincoln High School class of 1940, who was killed during WWII on April 5, 1945 when he threw himself upon a German hand grenade to shield his fellow soldiers in the 442nd Regimental Combat Team. 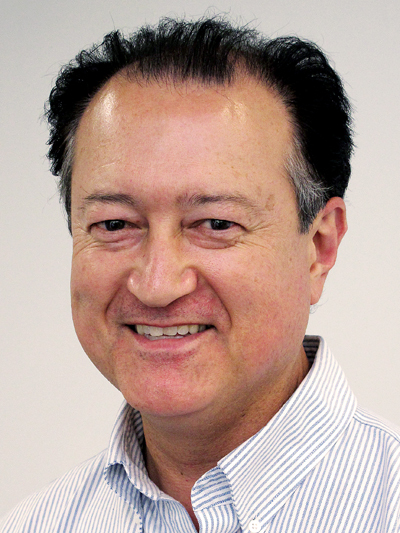 I heard about this effort from concert promoter/producer Gerald Ishibashi (see http://tinyurl.com/llkuj4s). He told me how his friend, photographer Mike Ibarra, and other members of the LHSAA are working to build a monument in Munemori’s memory near the school’s flagpole area. Ibarra says that as far as he and the LHSAA know, Munemori is their school’s only Medal of Honor winner. Ibarra told me the LHSAA are looking to raise a few thousand dollars to fund the monument. He also said that they expect to get $1,000 in seed money from the city of Los Angeles (the committee just needs to complete some paperwork), and he expects Lincoln High alumni who are military vets to also chip in. “We’re just pushing it as much as we can through Facebook and through our email connections,” he said. Ishibashi also told me that Ken Hayashi of the Japanese American National War Memorial Court Alliance is also raising funds for its Activities Fund for events like the May 13 Spit and Polish cleanup and to replenish the Maintenance Fund used by the JACCC to keep up the Court of Honor. Both the Lincoln High alumni group and the Japanese American National War Memorial Court Alliance will be raising funds in July at the Stonebridge Rhythm and Blues Fest, which is being produced by Ishibashi. According to Hayashi, both groups will essentially be piggybacking on that concert, with the former selling raffle tickets and the latter operating the wine bar. Proceeds from those respective fundraising drives will go a monument for Munemori at Lincoln High School and to the Alliance’s activities fund. As for the Stonebridge Rhythm and Blues Fest, it takes place at 4 p.m. on Sunday, July, 23 at the Redondo Beach Performing Arts Center, 1935 Manhattan Beach Blvd., Redondo Beach. For tickets and info on the artist lineup, visit http://tinyurl.com/ktdoebg. If you use the promo code “rafu,” you can get 10% off the ticket price. So, this Memorial Day weekend, whether you’re having a picnic, a barbecue, visiting relatives or binge-watching a bunch of TV shows you’ve stockpiled, at the very least, please take just a minute to remember and thank those vets who made the ultimate sacrifice so you can enjoy those activities. “Shichinin no Samurai” Dept. : Last column I mentioned how Steven Okazaki’s documentary, titled “Mifune: The Last Samurai,” is now on Netflix. If you are interested in seeing that classic 1954 movie “Seven Samurai,” directed by Akira Kurosawa and co-starring Toshiro Mifune, it’s actually playing at 7:30 p.m. on Friday at the Egyptian Theatre in Hollywood. The address is 6712 Hollywood Blvd. While there’s nothing better than seeing it on a big screen, if you want to do that, visit the following link for more info and to pre-purchase your tickets! Go to http://tinyurl.com/krdknuq — and leave your katana at home.